South Sudanese refugees at the reception centre of the Palorinya Refugee Settlement Camp in the Moyo District (file photo). Kampala — Uganda's refugee sector may run into trouble after two major European donor countries froze funds to the UN refugee agency as a result of fraud, corruption, and mismanagement unearthed in an internal UN audit last year. Uganda is the largest refugee-hosting nation in Africa, catering to more than 1.2 million refugees, the vast majority of whom have fled conflict in the neighbouring countries of South Sudan and the Democratic Republic of Congo. Germany and the UK's Department for International Development, or DFID, both confirmed to IRIN that they have frozen funding to UNHCR Uganda, following issues raised in last November's audit report by the UN's Office of Internal Oversight Services, or OIOS. The report found that the UN's refugee agency, UNHCR, critically mismanaged donor funds in Uganda in 2016-2017. Uganda's state minister for relief, disaster preparedness, and refugees, Musa Ecweru, called for continued and increased support from the international community, saying refugee hosting was a "shared responsibility". "We have kept our doors open to refugees," Ecweru told IRIN. "More refugees are coming despite the peace accord in South Sudan and elections in Democratic Republic of Congo. This is putting a strain on us." The move by the UK and Germany - two of UNHCR Uganda's top four country donors last year - could cause disruptions to essential life-saving assistance for refugees, the UN refugee agency says. Cécile Pouilly, a Geneva-based UNHCR spokeswoman, confirmed the aid freeze without naming the donors. Pouilly said education, water, and mental health support were among the services most at risk, and that negotiations with donors were ongoing. The November audit revealed that UNHCR Uganda wasted tens of millions of dollars, overpaying for goods and services, awarding major contracts improperly, and failing to avoid fraud, corruption, and waste. The European Anti-Fraud Office in December confirmed to IRIN that it was "investigating allegations of fraud and irregularities regarding specific projects funded by the European Union to support refugee settlements in Uganda." Four Ugandan officials who were forcefully asked to step aside in February 2018, pending investigations - including the commissioner for refugees in the Office of the Prime Minister, Apollo Kazungu, and three of his staff - are yet to be arraigned and charged in court. UNHCR has not provided any information about disciplinary action, if any, taken against its employees. "It's high time to hold individuals involved in corruption scandals accountable and find ways to continue to support refugees while minimising the risk of financial mismanagement," said Thijs Van Laer, programme director at the International Refugee Rights Initiative. With the exception of emergency funding to help prevent an Ebola outbreak, "DFID has released no further funds to UNHCR in Uganda since the allegations of corruption emerged," a spokesperson for DFID in London told IRIN. The statement listed funding in 2016 and 2017, suggesting that DFID has not provided funding since January 2018. "We will only provide further funding when we are confident that UNHCR has properly addressed the issues raised in the recent audit," the DFID spokesperson said. "We have asked UNHCR to provide detailed information on whether any UK funding has been lost due to issues raised in the audit." DFID provided £20.1 million (about $25.9 million) in funding to UNHCR in Uganda during 2016 and 2017, according to the DFID spokesperson. "DFID has a zero-tolerance approach to fraud and corruption of any kind," the spokesperson said, adding, "where British taxpayers' money is misused, we expect our partners to take firm and immediate action." In an emailed statement, German diplomats told IRIN their government's money was "contingent on the implementation of stringent integrity measures", and said Germany "will continue its funding in Uganda once the necessary measures have been adequately implemented." Germany, UNHCR Uganda's second largest donor last year with funding of over $15 million, continues to support the refugee agency's other projects worldwide, the diplomats said, emphasising that funds allocated for humanitarian assistance must be used in the "most effective and efficient way". UNHCR's Pouilly said four of 12 critical issues identified in the audit had been resolved, including: strengthening partner selection and procurement; improving reception and registration or refugees; and bolstering management and oversight capacity. "While there have not been any funding cuts per se, two donors have decided to freeze funds until they receive additional information on the strengthening of our operational response in Uganda and our efforts to mitigate risks in a sustainable manner," she said. "We are closely working with these donors to ensure that they receive the information and assurances they need to be able to restart funding our operations in Uganda." UNHCR said the fund freeze threatened to disrupt humanitarian aid programmes and would put further strain on Uganda's already limited public services. "A drastic reduction in resources for UNHCR and its partners in Uganda will impact the range, the quality, and the management of life-saving services we are providing on the ground," according to Pouilly. UNHCR had set a target of $448 million to raise for 2019 Uganda operations - for it and its 30 partner organisations. It only raised $173 million of its target in 2018 and currently has $130 million on hand. "In addition to the $130 million I have authority to spend, we need 30 to 40 million now to be able to retain this minimum level access to services," UNHCR country representative Joel Boutroue told journalists in the capital, Kampala. "The lack of funding directly translates into more hardships for the refugees, more hardships to the host communities and more tensions." In December last year, South Sudanese refugees in Bidi Bidi, until recently the world's largest refugee settlement, staged a violent protest over lack of food, destroying NGO vehicles and looting property. Similar protests have occurred in Uganda's Arua and Adjumani districts. "Uganda can't handle this crisis alone," Ecweru said. "We continue to remind our donors, partners and friends [in the international community] that this is a shared responsibility. They should communicate to their capitals and government so that more support continues to come." Pouilly said that without additional funding, reception facilities for new arrivals would remain inadequate - a particular concern given the risk of Ebola spreading from Congo. 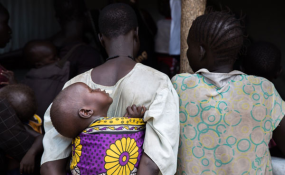 "The last thing refugees in Uganda need is a reduction in the means to support them," said Van Laer, from the International Refugee Rights Initiative. "The refugee response is already seriously underfunded and 2019 risks becoming a challenging year."